Alburq and Vengeur Masque are the stable representatives at Caulfield on Saturday. Alburq (pictured) is in the colts and geldings Blue Diamond Preview (1000m) where he will be ridden by Jordan Childs. Moroney said the son of Rubick is an ideal two-year-old type. “All the judges are telling me there are a lot of different form lines in the race but I think Alburq’s form is pretty good,” Moroney said. “One thing in our favour is he is a natural two-year-old. He galloped really well on Tuesday with Hawker Hurricane and they walked back to me and stopped to have a pick of grass. “They are both relaxed sorts and both have a great brain which is so important - I’m a great believer in not many horses are natural two-year-olds but both these colts are. "Alburq is a big, powerful colt and one of his advantages is that he does things right,. “He’s shown good speed in both his starts so I’d say if he jumps cleanly on Saturday then he’ll go forward but Jordan will have a plan B in case. “He’s always jumped away cleanly and I can’t see any reason why he won’t again on Saturday. Vengeur Masque is resuming following a spring campaign that finished with a third place finish in the Sandown Cup over 3200m. The import runs in race seven, the Open Handicap over 2000m and prepared with a 1400m jumpout at Flemington last Friday. “He’s fully mature now and come back in tremendous order,” Moroney said. “He’s put on a bit of weight which is good. 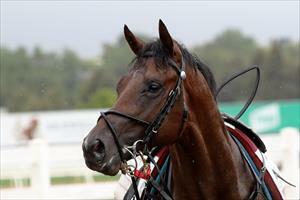 “He’s retained a fair bit of residual fitness and is fit enough to run 2000 metres first-up.